Let me first start by introducing myself–I am Dr. Ralph R. Reynolds, DMD, MD and I am an Oral and Maxillofacial Surgeon (OMS) in Loveland and Greeley, Colorado. As a father of four children, I know the time will be coming when I need to remove their wisdom teeth. Often times, patients will ask me why they even have wisdom teeth. Anthropologie studies found that the rough diet of early humans resulted in wear of their teeth. The worn teeth shifted making more space for the wisdom teeth. The occurance of impacted wisdom teeth was around 25% back then. The modern diet, which is much softer, and the popularity of orthodontic tooth straightening procedures produce a fuller dental arch, which quite commonly doesn’t leave room for the wisdom teeth to erupt, thereby setting the stage for problems when the final four molars enter the mouth. Problems such as infection, damage to adjacent teeth, crowding, improper bite (malocclusion), cysts and tumor formation occur due to wisdom teeth that don’t have enough room to attain a healthy position in the mouth. A tooth becomes impacted when there is a lack of space in the dental arch and its growth and eruption are prevented by overlying gum, bone or another tooth. 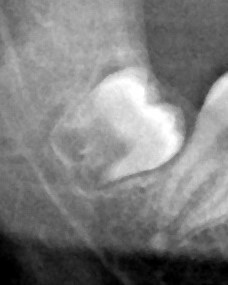 In impacted third molar can lead to infection, crowding or damage to adjacent teeth, or cyst formation. Does the Tooth Have to Come out if it Hasn’t Caused Any Problems Yet? The most common question I am asked is when wisdom teeth should be removed. Below, I provide some information on wisdom teeth. This information is aimed at helping you distinguish the proper timing for the removal of wisdom teeth. My recommendation is to have patients get a panoramic x-ray at the age of 15 years old, and be prepared to have them out around 16. This is the most common time for removal of wisdom teeth. It isn’t wise to wait until your wisdom teeth start to bother you. Wisdom teeth are easier to remove when the patient is younger, since their roots are not completely formed, the surrounding bone is softer, and there is less chance of damaging nearby nerves or other structures. Removal of wisdom teeth at a later age becomes more complicated as the roots have fully developed (involving the nerve) and the jawbone denser. Younger patients do better for surgical procedures, which minimizes overall complications. I have removed wisdom teeth which were considered to be in the ideal root formation category, (from 1/3 to 2/3 root formation), in patients as young as 11 years old. And I have also seen patients that were twenty-five years old and who still have had only 2/3’s root formation. The most common age for wisdom teeth to be in the 1/3 to 2/3’s root formation stage is 16 years old. Older patients (25+) may be at greater risk for disease, including periodontitis in the tissues surrounding the third molars and adjacent teeth. Periodontal infections may affect your general health. Regarding root formation; the ideal time to remove wisdom teeth is when there is 1/3 to 2/3 root formation. You can find this out by having a panoramic x-ray, which can be taken at our office, or other dental offices. When there is more than 2/3’s root formation, there is an increase of risk for removing wisdom teeth. These risks include nerve injury to the inferior alveolar nerve on the lower jaw, and maxillary sinus involvement in the upper jaw. 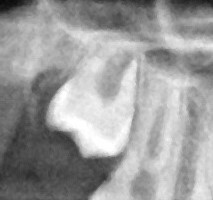 One of the considerations when looking at wisdom teeth is whether they will be able to erupt into a removable position. The root formation brings the tooth up to the surface causing eruption of the tooth. However, in cases of wisdom teeth when there is insufficient space, the tooth may not be able to erupt regardless of how much root formation occurs. The root formation can make them more likely to have nerve injury or sinus involvement. If the wisdom tooth is already jammed against the adjacent tooth then its probably time to get it out. 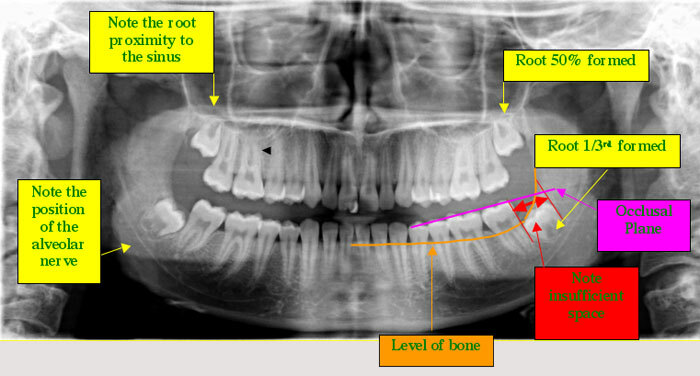 Below is a panoramic x-ray that explains root formation, sinus proximity and nerve location. As well as, insufficient space, which means the jaw doesn’t have room for healthy eruption of wisdom teeth. This can also cause problems such as decay to adjacent teeth, cysts, periodontitis, pericoronitis which is inflamed tissue around the crown of the tooth that can also become infected. Pericoronitis can lead to Ludwigs Angina which is a serious infection that is life threatening. To learn more about wisdom teeth services provided by Dr. Reynolds, please visit our website. Welcome to Reynolds Oral & Facial Surgery! Follow Reynolds Oral & Facial Surgery!